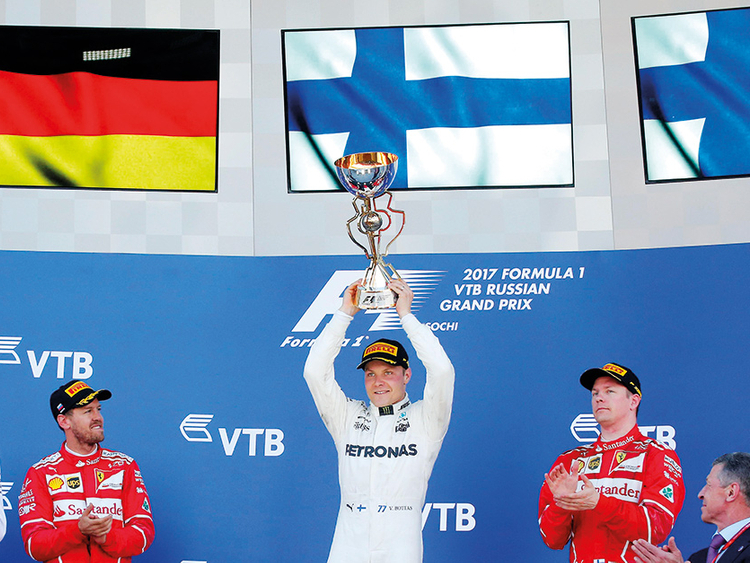 Sochi: After four evenly-contested opening ‘flyaway’ contests, Formula One returns to its European homeland with Ferrari revived and a fiercely-competitive season in prospect as champions Mercedes battle to retain their crown. This much became clear after a roller-coaster weekend at the Sochi Autodrom where the popular Valtteri Bottas secured his maiden victory for Mercedes to lay down a personal marker while his puzzled teammate Lewis Hamilton struggled to fourth. The Mercedes pairing were separated by the two Ferraris of championship leader Sebastian Vettel and Kimi Raikkonen on a day of little overtaking, but much tension. “It’s going to be extremely close,” said Mercedes team boss Toto Wolff. “More than very close. Finn Bottas’ win rescued Mercedes after Ferrari dominated qualifying, four-time champion Vettel taking pole with Finn Raikkonen alongside him — their first front row lockout for nine years. The unflappable Bottas has proved already that he is not only very different to retired 2016 champion Nico Rosberg, but likely to be just as formidable a teammate to three-time champion Hamilton. “For me, it is just the start, the beginning of the year,” he said. “It’s too early to talk about the championship in any detail. “We are just focusing on making the car better and that will give us more wins for both cars. “Getting the first win is something special, for sure, even though you always believe in yourself. If you think you are not able to win you should stay home, but to get confirmation and get a good result, that matters in this world. After reigning supreme for three years, Mercedes face a scrap. Last year, they won 19 of the 21 races, failing only twice and already, in four outings this year, they are two apiece with Ferrari. As a result, although Mercedes hold a one-point lead in the constructors’ championship, Vettel leads Hamilton by 13 in the drivers’ title race as the teams prepare for the introduction of major upgrade packages at the Spanish Grand Prix on May 14. Bottas’s win, however, may make life awkward for Mercedes and Hamilton if Ferrari show favour for Vettel, who has 86 points ahead of Hamilton on 73 and Bottas on 63, with Raikkonen fourth on 49. Wolff explained last week that he prefers to see Mercedes drivers racing each other, without team orders, because it pushed the team development and overall pace, but such a scenario is less likely at Ferrari. Vettel expects a close contest between the major teams, but believes also that Red Bull will force their way into the picture when they introduce their updated car at Barcelona. “There are so many rumours going around now and I know they can build a quick car so, for me, it is a question of when, rather than if. It is going to be exciting,” said the German. The emergence of Bottas adds to the mix for the championship in many ways. His relationship with fellow-Finn Raikkonen is not close and has often created intense on-track rivalry. He is also showing, with his pole position in Bahrain and victory in Sochi, that he has the pace to beat teammate Hamilton. For now, however, he said he is content to take it one race at a time and enjoy his successes. Raikkonen’s emotions, after finishing third, may also have been stirred, but in a very different way. The 2007 champion is 10 years older than Bottas and may feel he has something to prove.